I thought it was time for another little moshi-moshi giveaway. If you would like to take part and have the chance to win this nostalgic dress please leave a comment at the end of this post. I will pick the winner using random.org at the end of the week. Thanks so much everyone for taking part, it is my way of saying thank you for all the support and kindness you give me. I tried to comment before but I don't think it worked! Beautiful! I love me some Moshi-moshi! What a beautiful dress, thank you for giving us all a chance! Can i take part? I really love the dress! You are wonderful! Love this gorgeous dress! So beautiful! I would love a chance to win! You are so awesome! Thanks for the amazing give away!! Big thanks for the opportunity Hilary! Good luck to all! Lovely set - thank you for your generosity! Adorable as usual. Must tell my little sister about this, she adored your stuff in Barcelona. 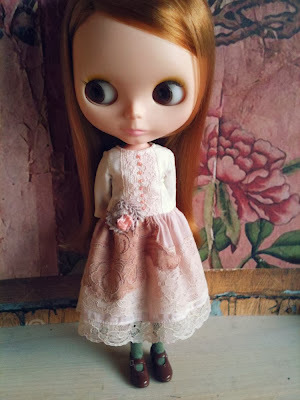 Beautiful dress, love the laces. Oh, what a delightful thing it would be to win this!! Thank you so much! That dress is gorgeous! But then everything you make is! Thanks for having a giveaway! You are so generous with sharing your lovely Blythe clothing. Thank you. It's so very lovely! Thank you for posting this giveaway! I've really enjoyed seeing the all the new styles and creations you've been designing. Such a lovely dress and generous giveaway! Beautiful! Love, love, love Moshi style. It's so beautiful! Thank you for the giveaway.